In recent decades, ecologists have uncovered how trees communicate with each other via expansive underground networks of fungus called mycelium. As research continues, this hidden communication has been found to be a symbiotic infrastructure of resources, passing nutrients, defense signals, and even acknowledgment of kin. 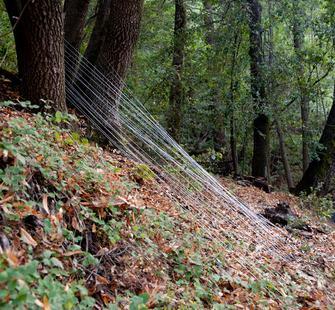 Drawing on this research, Myrbeck and Shisko have created Hyphae--a multichannel immersive sound installation on a switch-back trail leading from the Lucas Artists Residency complex to Montalvo’s main campus--that embodies the structure of the mycelium networks used for communication in our forests. Multiple loudspeakers will each aurally represent one tree. The mycelium will be interpreted visually by strands of material arranged in a form inspired by the filaments (or hyphae) of the fungal networks.